For the best results, the stuffing should be prepared immediately before the turkey will be stuffed, and the turkey should be stuffed immediately before it is ready to go into the oven. 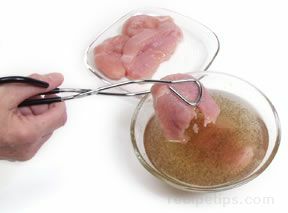 This will reduce the risk of the growth of harmful bacteria. Some cooks make the mistake of preparing the stuffing and placing it in the turkey well in advance of roasting the bird in order to save time, but this is a dangerous practice. 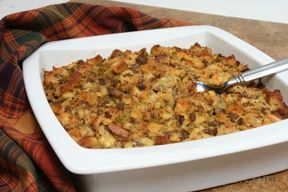 Even if the stuffing is to be baked in a separate dish, the ingredients for the stuffing should not be mixed together until it is time for the dish to be placed into the oven. 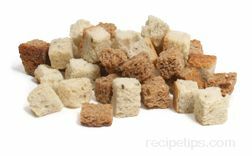 There are, however, some steps that can be taken to save time, such as chopping the vegetables or preparing dried and cubed bread for the stuffing base. 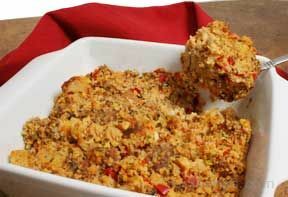 This provides an easy situation in which the stuffing ingredients can be mixed quickly, immediately prior to the time that the turkey is to be cooked. The total quantity of stuffing that is prepared may not fit properly inside the turkey. 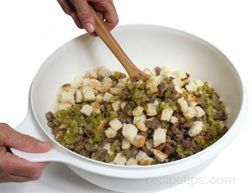 In this case, the extra stuffing can be cooked in a baking dish. 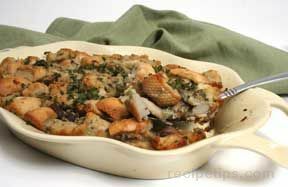 Many cooks prefer to place all of the stuffing in a baking dish because an unstuffed turkey does not require as much time to cook to the proper doneness. 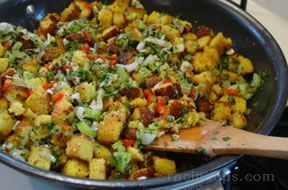 Described below are some important points to remember concerning stuffing. The turkey should not be overstuffed. 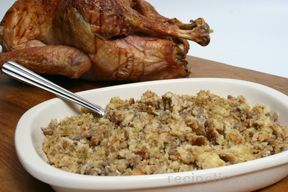 The stuffing will expand during the cooking process and some of it may not cook thoroughly because of the density of the stuffing inside the turkey. 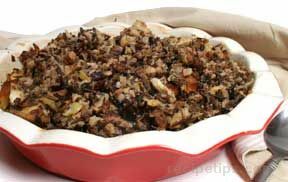 The stuffing should be cooked to a temperature of at least 165°F. Remove the stuffing from the turkey before the turkey is carved. 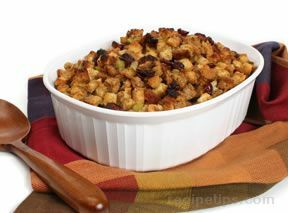 Allow as much as 3/4 cup of stuffing per pound of turkey or as much as 1 cup of stuffing for each guest. NEVER stuff the turkey in advance. 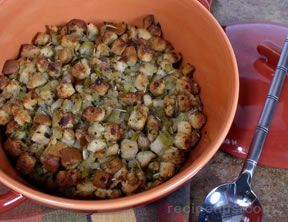 The stuffing may promote the rapid growth of harmful bacteria. 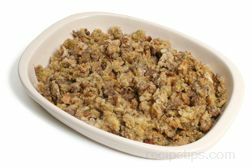 Leftover stuffing should be refrigerated and used within 1 or 2 days. It should never be frozen for use on a later date.